Esther Duflo is the Abdul Latif Jameel Professor of Poverty Alleviation and Development Economics in the Department of Economics at the Massachusetts Institute of Technology and a co-founder and co-director of the Abdul Latif Jameel Poverty Action Lab (J-PAL). In her research, she seeks to understand the economic lives of the poor, with the aim to help design and evaluate social policies. She has worked on health, education, financial inclusion, environment and governance. 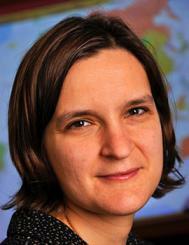 Professor Esther Duflo’s first degrees were in history and economics from Ecole Normale Superieure, Paris. She subsequently received a Ph.D. in Economics from MIT in 1999. Duflo has received numerous academic honors and prizes including the Princess of Asturias Award for Social Sciences (2015), the A.SK Social Science Award (2015), Infosys Prize (2014), the David N. Kershaw Award (2011), a John Bates Clark Medal (2010), and a MacArthur “Genius Grant” Fellowship (2009). With Abhijit Banerjee, she wrote Poor Economics: A Radical Rethinking of the Way to Fight Global Poverty, which won the Financial Times and Goldman Sachs Business Book of the Year Award in 2011 and has been translated into 17 languages. Duflo is the Editor of the American Economic Review, a member of the National Academy of Sciences and a Corresponding Fellow of the British Academy. Can randomized trials eliminate global poverty? Esther Duflo: "No podemos permitirnos el lujo de darles la espalda a los refugiados"
"Learning’s not about enrollment, latrines in school. We’re failing children on a massive scale." Will India’s Right to Education Act Upset Stereotypes? What Connects Cellphones and Toilets? Les politiques d’accompagnement des chômeurs sont-elles vraiment efficaces? Poor Economics: Rethink on Poverty? You Think You Know What the Poor Want? A New Look At An Old Problem: Why Do So Many Poor Children Miss Out On Essential Immunizations? Why Doesn’t Microcredit Create Entrepreneurs? Who's Getting Stuck in the Poverty Trap? What's the Truth About Hunger? Can Evidence Play a Role in the Fight Against Poverty? More Than 1 Billion People Are Hungry in the World? MIT Professor Works to "Deworm the World"
Watch Esther Duflo's Ted Talk, "Social Experiments to fight poverty." Meeting MDGs "Not Rocket Science"
Does Non-Symbolic Math Practice For Young Children in India Improve Symbolic Mathematics Ability Later in Life? Can Informational Campaigns Raise Awareness and Local Participation in Primary Education in India?